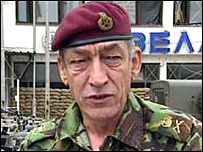 Former head of the Army General Sir Mike Jackson has given his support to a campaign demanding better treatment of Britain's armed forces. Sir Mike said the British Royal Legion campaign was about acknowledging the value of the armed forces. He said that wounded soldiers and their families deserved to be treated "fairly and decently". The Legion says Britain is failing in its duty of care to its armed forces and former servicemen and women. The Legion also claims the military covenant - the obligation to support people who fight for their country - is not being honoured. Sir Mike told BBC Radio 4's Today programme: "It is not just a question of the Ministry of Defence or the Treasury, it's also a question of the nation having this sense of value of its servicemen." The Royal British Legion campaign - titled Broken Covenant - will focus on the need to boost medical care, strengthen the system of coroners' inquests to ensure swift closure for bereaved families, and provide more compensation - particularly for military personnel who suffer multiple injuries. The issue of compensation and how it is calculated has been highlighted by a number of cases involving servicemen wounded in Iraq and Afghanistan. General Sir Mike Jackson, the former head of the British Army, said: "These compensation schemes are hard-fought with the Treasury whose heart is perhaps a little stony in these matters. "People get bogged down in the minutiae of the rules and don't really look at what the outcomes are." While the military covenant is not legally binding, the Legion says it been enshrined through convention and custom, and represents "the nation's moral commitment to its armed forces." Speaking at the campaign launch, Frances Done, director general of the Royal British Legion, said: "We believe the nation has failed to live up to its commitments under the covenant, with the consequence that some people have been left to struggle alone once they leave the services. "Charities such as the legion are increasingly being called upon to fill the gap." Armed Forces Minister Bob Ainsworth welcomed the campaign but said neither he nor military chiefs believed the covenant is broken. He said: "There are areas where we have already made significant progress, but we acknowledge that we must do more. These areas include mental healthcare for veterans, compensation, inquests and accommodation." He added the government was working with the NHS to develop a new model of community-based mental health care for veterans.